The reserve is oozing with birds with 46 marsh harriers coming into roost, a couple of hen harriers and a rough legged buzzard over the saltmarsh. A selection of grebes and divers are on the sea, whilst freshmarsh has hundreds of wigeon, teal, golden plover and lapwing. A water pipit is showing incredibly well in front of Parrinder hide. Fridays highlight was a Bewick's swan which brings the reserve year list up to 214. Other highlights include at least one ringtail hen harrier and a rough legged buzzard. Weekend highlights included at least 3 Grey phalaropes on the sea, 35+ marsh harriers and 80+ little egrets into roost. Highlights from the past couple of days including a good variety of birds on the sea including a late sandwich tern and a swallow in Titchwell village. Marsh harrier roosts are building up with 32 birds seen the other night along with a hen harrier. A steady weekend of birding at Titchwell with birds to be seen across the reserve. The little egrets are still on site roosting with 60+ counted on Sunday and marsh harrier numbers building. It is a good time of year to look for rough legged buzzards and there have been several along the norfolk coast in recent weeks. Would you like to help support the work of RSPB Titchwell through volunteering? We have a number of volunteering opportunities available in the cafe, the shop and as an information assistant. You will become part of a friendly team and help ensure visitors have a high quality visitor experience. Lots of action on the sea the past few days, but there was another big arrival of thrushes and finches passing through the reserve. Yellow browed warbler continues to be heard around the meadow trail and a waxwing flew through on Thursday. Marsh harrier roost is beginning to pick up with 22 coming into roost this week along with 76 little egrets. Weekend highlights include an early morning ring ouzel in the picnic area, a hawfinch near to the fen hide and a couple of stonechats. Roosting marsh harrier numbers are beginning to increase so it is well worth spending an evening on the reserve where you will also witness pink-footed geese flying over, barn owls and short eared owls, if you are lucky possibly a hen harrier. The highlights over the past few days have been a single waxwing in the car park, a couple of yellow browed warblers and a brief ring ouzel. Today was the monthly WeBS count on the reserve in which we count all the waterbirds. 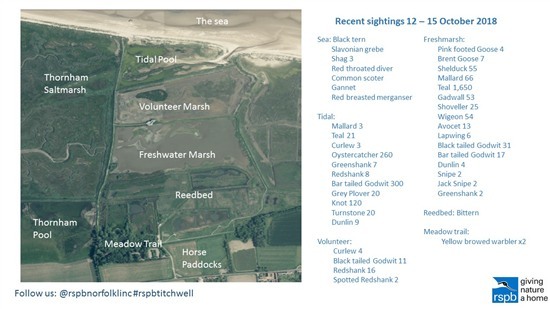 There was an impressive number of teal, almost a reserve record! A couple of yellow browed warblers in the scrub. With rain and a NE wind blowing today and overnight there is every chance of some migrant passerines dropping in on Tuesday. The NE winds brought with them the arrival of birds from the continent including a couple of elusive yellow browed warblers. The first woodcock of the winter was spotted in the car park first thing on Monday and a hen harrier was seen arriving in off the sea. The reserve team will be carrying out essential habitat management work on the Freshmarsh this week. They will be out on Tuesday 9th and Wednesday 10th October. A seawatch continues to be fruitful with Arctic, Great and Pomarine skua. Coming in off the sea was a rough legged buzzard and a short eared owl. 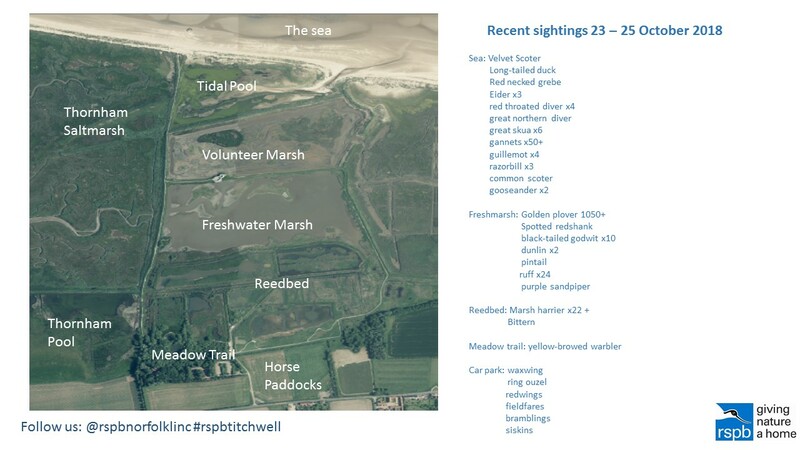 Whilst on the freshmarsh the wildfowl numbers continue to build.